Traffic on Main Street and 15th Street is likely to be impacted for a few months thanks to an upcoming CSO separation project. 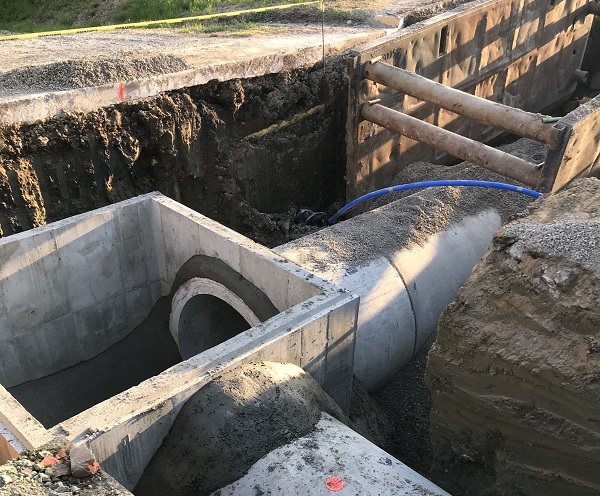 The Dam 6 Sewer Separation Project, which will construct a new stormwater-only concrete pipe from White Clay Creek to the overflow of Dam 6, is set to begin construction later this month. Curb inlets along the route of the pipe will also be reconstructed to connect to the new stormwater-only system. Residents will likely notice the construction work as the contractor crosses Main Street between 15th and 16th streets in the early weeks of the project. Work will continue up the 15th Street right of way between Main Street and Commercial Street as the project progresses. Main Street will be reduced to one lane in each direction during the crossing. 15th Street from Main Street to Commercial Street will likely be completely closed during construction activity. The Dam 6 Sewer Separation Project is the next step for the City of Atchison to maintain compliance with the Clean Water Act of 1972 and the subsequent consent agreements that have been established between the City and the Environmental Protection Agency (EPA) and the Kansas Department of Health and Environment (KDHE). The City has secured financing for the project through KDHE’s Revolving Loan Fund program, an offering that provides below market interest rates for qualifying utility projects. Amino Brothers Construction will serve as the general contractor, besting 11 other bidders to win the contract for the project. BG Consultants, the firm that designed the project, was also hired to perform construction inspection and materials testing services once the project gets underway. The construction set to begin this month includes Phase I of the project, which runs from White Clay Creek to just north of Commercial Street along 15th Street. This phase will last about four months. Phase II, which picks up from the termination of Phase I and carries the project to the overflow of Dam 6, is expected to be built this summer and fall. Project Summary: As a City founded over 150 years ago, much of Atchison was originally built utilizing a single, combined sewer system (CSO). That infrastructure was great in the late 1800’s and early 1900’s, but not so great following industrialization, the Clean Water Act, and subsequent water quality standards for both water and wastewater. A combined sewer system works just fine during dry weather when all the wastewater flows to the Wastewater Treatment Plant and is cleaned prior to discharge. However, during wet weather, the capacity of the combined system is flooded, resulting in overflows of untreated sewage directly into White Clay Creek and the Missouri River. When the Clean Water Act was originally passed by Congress, there was substantial federal money available to help fund CSO mitigation projects in cities across the country. At the time, the City of Atchison chose not to pursue any CSO mitigation projects and therefore received no federal funding to do so. About 10 years ago, the EPA and the Kansas Department of Health & Environment (KDHE) got serious about forcing Atchison to make more substantial progress toward remediation of the combined sewer system. The City and KDHE engaged in negotiations to finalize a Consent Agreement and Final Order (CAO). The CAO became effective on December 14, 2011 and contains a series of requirements for improvements and progress that must be achieved within certain timelines. Unfortunately, there are practically no federal grant dollars available for CSO mitigation projects given today’s federal funding landscape. That effectively means that all of the expense of those required projects is now the sole responsibility of the City of Atchison. The CAO specifically mentions the next priority for the City is to be remediation of the combined sewer overflows in both the 11th and 14th Street sewersheds. For KDHE, 11th and 14th Street are the most immediate priority because overflows occur in the open waters of White Clay Creek, whereas the other overflow points occur within the confines of the box culvert that contains White Clay Creek between the Missouri River and 7th Street. Given the hydraulic modeling and flow monitoring data collected by Burns & McDonnell, a consulting engineering firm, staff believes that overflows from Watershed Dam 6 are the single largest contributing factor to overflows in the 14th Street sewershed, making it a natural place to begin work in that area. Funding: This project is entirely funded by the City of Atchison Wastewater/CSO Capital Improvement Fund, although the project is financed through a Revolving Loan Fund with the Kansas Department of Health & Environment. Location: The project needs to connect White Clay Creek (on the south side of Main Street) to the Dam 6 Overflow location near the intersection of 16th Street and Atchison Street. Follow this link to read a letter sent to the neighbors in the vicinity of the project, inviting them to attend a public meeting on Tuesday, May 1, 2018 at 5:30 PM at the Sacred Heart Catholic Church.